OXFORD, Miss. – On Wednesday, Sep. 13, the Department of Pharmacy Administration honored Steve Blackwell with its 2017 Alumnus of the Year award. Blackwell earned his Ph.D. in pharmacy administration from the School of Pharmacy in 1998. For nearly the past 20 years, he has worked with the Centers for Medicare and Medicaid Services as a social science research analyst with the Research and Rapid-Cycle Evaluation Group in the Center for Medicare and Medicaid Innovation. 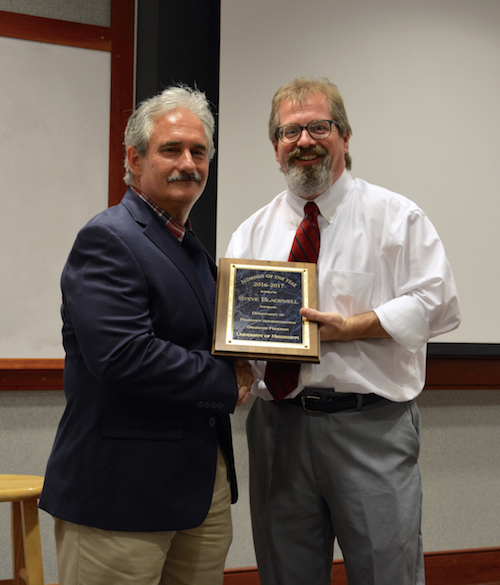 Pharmacy administration chair John Bentley (right) presents Steve Blackwell with the department’s Alumnus of the Year award. As part of his visit to the school to accept the award, Blackwell delivered a seminar called “The Life of a Federal Researcher,” that covered some of the research he’s contributed to as part of CMS. “Working with the federal government means I have a chance to change healthcare,” Blackwell said. Blackwell became a practicing pharmacist in 1983 and later completed law school prior to earning his Ph.D. at the University of Mississippi. During graduate school, he taught the pharmacy law course. After school, he worked with the Clinton administration as a presidential management intern to the federal government in 1998. One year later, he went to work with the Centers for Medicare and Medicaid Services. In addition to his work with CMS, Blackwell works part time as a retail pharmacist. Chair of the Department of Pharmacy Administration John Bentley said Blackwell continues to be in contact with the department and is interested in learning about its activities and developments. Bentley also credited Blackwell with influencing the direction of the department when Blackwell suggested something called the Prescription Continuity of Care System in the early 2000s. This project set the foundation for the department’s use of Medicaid and Medicare data in its research. Alicia Bouldin, professor of pharmacy administration, earned her Ph.D. at the same time as Blackwell, even sharing neighboring cubicles with him in the graduate student office.